- Private site in Value section of Heritage. Only site in the Value section with green space on both sides of the unit. Perfect for your pets enjoyment! As with all our rental sites, the rental rate includes the class A motor coach site, the pedestal with water, electric, cable and internet hookups, access to the sites the outdoor patio amenities at the site and of course all the resort amenities. We do not rent access to any coach house. All of our rental sites have assorted patio furniture included. Some will have more amenities than others. CLUBHOUSE Our two-story, low country style clubhouse is located on the southern most point of the resort, the premier site on the property. This ensures that the spectacular views are available to every Heritage unit owner to enjoy. The outdoor pavilions, decks and terraces provide welcome gathering places for owners and their guests; the outdoor pool features an infinity edge design, which makes the water appear as if it is bubbling up from the ground like a natural spring. The view from the pool is truly spectacular, as its edge blends with the horizon and the bay into one seamless vista. The clubhouse's interior features a state-of-the-art fitness center, men and women's showers, a laundry facility and kitchen, as well as a stately Grand Room that's fully equipped for entertaining. It's easy to relax and get to know your neighbors at this social heart of the Heritage community. 3,000 SF 2-Story Clubhouse 1,300 SF of Decks and Terraces Situated Directly on the Bay Grand Room Men’s / Women’s Restrooms with Showers Laundry Facility Fitness Center Infinity Edge Pool Outdoor Pavilion with Fire Pit in the center. ON LAND Each motor coach site at Heritage offers ample space and utility hookups for your Class “A” motor coach. Perhaps the most attractive amenity to resort lot owners is the coach house that comes with each site. Each coach house Features the same architectural stylings and materials as the resort’s clubhouse. Landscaping is maintained by the Heritage grounds crew ensures beautiful natural surroundings for every site. +/- 20’ x +/- 70’ dimensions Concrete Pad. 11'x25' Coach House. Coach House Includes Power, Cable, Water and Sewer Hookups. Wi-Fi Internet Access. Detailed Landscaping Maintained by Condo Owner’s Association. Protective Covenants and Restrictions to Ensure Resort Uniformity and Excellence. Created for Owners of Class “A” Motor Coaches only 34' or longer, 10 years or newer. 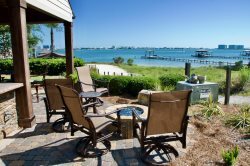 AT SEA Heritage is located within sight of Perdido Pass and the Gulf of Mexico, allowing our resort to serve as a port of call for yacht and sport boat owners. This close proximity to the ocean, an abundance of beam space and deep water placement makes our boat slips the perfect home base for deep sea fishing and cruising the thousands of miles of the Intracoastal Waterway. These strategically located boat slips, offered exclusively to Heritage motor coach site owners, are very limited and sales are available on a first- come, first-serve basis. Individually-Owned Deep Water Boat Slips Power / Water Hookups at Each Slip Marina Pavilion at End of Pier Within Sight of the Gulf of Mexico.